So, why would you wear just any old pair of glasses? Urban Eyecare understands. That’s why we not only carry designer frames…we go one step further. Our collection consists of handmade and limited production frames from designers who are leaders in the eyewear industry, such as Rapp, MOSCOT, Mykita, Ray-Ban, Lafont, Funk, Freudenhaus, Traction, Ogi, Seraphin, Booth & Bruce, t2, Mosley Tribes, Paul Frank, Entourage of 7, Volte Face and many others. 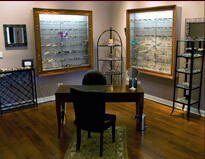 In some cases, we are the only shop that carries certain frames. So you can rest assured when you choose your frames here, you are getting a signature pair of glasses, worthy of being on your unique face every single day. And because we accept so many insurance plans, you can afford to get the frames you want at a price you can afford. Click here to find out what’s new in the showroom or just stop in! Click here to see a list of insurances we accept. Click here to learn more about our trunk shows where we offer entire collections of our frame lines for an even bigger selection, along with refreshments and a personalized shopping atmosphere. Think our frames would look great on a special person in your life? Stop in and get them a gift certificate. Perfect for holidays, birthdays and special occasions.